Update: In addition to the new iPhones, the Express Cards feature we talk about below is a part of select older iPhones via the iOS 12 update. Apple slipped it into the tech specs page of already-released phones, too. We've also noted the colleges where this will work. 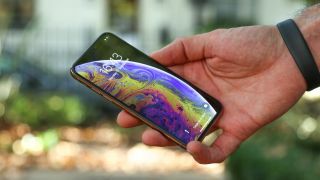 The iPhone XS, iPhone XS Max and iPhone XR solve this legitimate concern with an NFC chip that works several hours after your new iPhone battery dies. This also works with all iPhone 8 and iPhone 7 phones if you update the operating system. Apple's official iOS 12 security guide, specifically Page 16 of the guide, indicates that designated cards for transit and student ID are supported by this new feature. 'If iOS isn't running because iPhone needs to be charged, there may still be enough power in the battery to support Express Card transactions,' reads the guide. Express Cards with power reserve, as Apple's official tech specs call the feature, will work with NFC transit cards in China and Japan, and student ID cards in the US, so long as they're stored in the iPhone Wallet app. So far student IDs – a new feature for iOS 12 – are being used three US colleges: Duke, the University of Alabama, and the University of Oklahoma. It'll come by the end of the year to Johns Hopkins University, Santa Clara University and Temple University. No longer fear of getting stuck without an NFC-enabled metro card or student ID when your phone dies. When your new iPhone runs out of battery, you'll see a message notifying you that the Express Cards are available to use. Simply tap an NFC-reading terminal with your iPhone and you'll feel a haptic response. No visible notification is shown. Keep in mind, this won't work for your usual Apple Pay transactions. While Apple Pay uses the same NFC chip, it requires Face ID for authentication, which won't work if the phone is powered off. There is a time limit on how long this will work, of course. Express Cards will function for up to five hours after your phone dies. Five hours should be enough time to find an iPhone charger or portable battery pack. More importantly, it alleviates the fear of getting stuck outside of a metro station or outside of a dorm without an entry method. It's been the major downfall of relying NFC – at least before today. We're continuing to test out the iPhone XS and iPhone XS and await the iPhone XR (October 16 pre-order date, October 23 release date). But, it seems like they're all a little more powerful than Apple had time to detail at its 'Special Event' last week. H/T to AppleInsider for first spotting the guide.